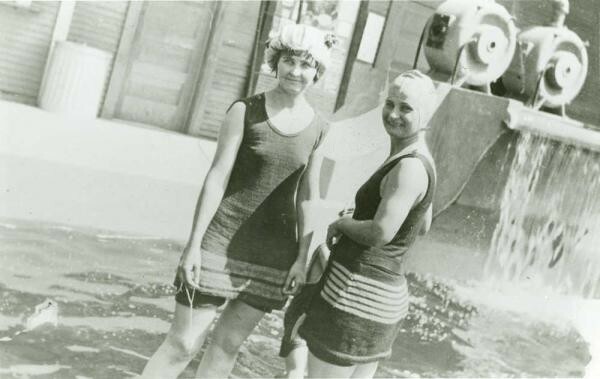 In July 1922, the Amarillo Natatorium Company opened an enclosed open-air swimming pool, giving the people of Amarillo a place to escape the sometimes harsh Panhandle heat. The structure was designed by Guy Carlander, a noted Amarillo architect, and boasted that it had the latest in pool technology. From its opening day advertisement to present-day, the building has been known as "The Nat." To utilize the pool year-round, the structure was covered in 1923. Evidence of the former natatorium can still be seen inside and outside, especially areas of interior and exterior lap siding, as well as signs admonishing bathers to "Keep off the Roof." The swim season was cut short in 1926, when JD Tucker purchased the pool and converted into a dance palace. A superstructure of crisscrossed timbers was built in the pool on which subflooring and approximately 10,000 square feet of maple flooring was laid. The art deco decorations that adorn the upper level date back to 1937. The first night patrons were treated to a free night of dancing to the music of El Hoover and his orchestra. On succeeding nights each dance cost five cents. Access to the dance floor was by ticket only, the floor being cleared after each dance. Bands who played the nightclub circuit were hired for both limited and extended engagements. The nightspot became a regular stop for Music Corporation of America orchestras. Dancers glided over the floor to the distinctive stylings of bands such as The Dorsey Brothers, Duke Ellington, Jan Garver, Harry James, Bob Wills, Guy Lombardo, and many others. Many of the same youngsters who learned to swim at The Nat recall with fond memories attending fraternity night on Friday evenings when the nightspot catered exclusively to the youth of the community and the area. At its prime, the ballroom employed a staff of 52 people to manufacture fun and to serve the Nat's clientele. Dr. William A. Maddox took possession of The Nat in the early 40s, and the ballroom remained in his family for more than 50 years. During the war years the ballroom was a popular haunt for the airmen based at Amarillo's airfield. Adjustments were made to accommodate the war effort. Many young men met their future mates at The Nat during this era. The Amarillo ballroom closed the doors to public dancing in the 60s and remained vacant except for several attempts to revive it. It currently houses a market place with items vintage, new, and handmade from over 100 vendors.